Musicians from Cats Claw, Dragons Breath, Juice and Ruff and Tumble will be playing. Murad Firm and Tone Serum is applied topically and is designed to help minimize imperfections and reduce the appearance of cellulite and stretch marks through the action of three key ingredients, cats claw, horse nut tree extract and cayenne pepper. 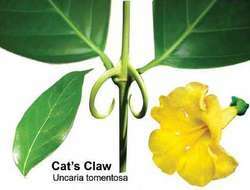 So we do not praise something like Cats Claw or Essiac, when there is no research to support it. But the most important reason cats claw is to mark their territory--the places they claim as their own.